Shirley discusses the two significant categories of custom data visualizations: exploratory and expository. It's explained why we will be using expository examples today, but that they are easily transferrable to exploratory data visualizations. Shirley gives the roadmap for how the course is structured. Shirley briefly goes over the different data types. To understand a dataset, students go through and writing down the data attributes and listing some data comparisons that may yield interesting results. Shirley works through the dataset by listing the data type for each of the useful data attributes, then listens to the audience's suggestions for worthwhile questions about the data to explore. Shirley records the potential questions from the previous section, and gathers more questions and hypotheses around that dataset that seem interesting. In this exercise, the audience is instructed to brainstorm and sketch possible chart types that will aid in answering questions they have about the data. Shirley reviews the audience's brainstorming chart sketches that explore potential ideas to visualize the data. While using a chart idea from the previous exercise, Shirley demonstrates the process of generating a scatterplot visualization in Vega-Lite. Shirley leads a discussion about what are some interesting aspects of the chart that, through further exploration, may lead to interesting results. Shirley reviews another student's brainstorming sketch and transforms the idea into a Vega-Lite line chart. Shirley demonstrates how to generate heatmaps with Vega-Lite displaying the release date and genre of blockbuster movies. Shirley urges gaining inspiration from work that has done before rather than attempting to start from scratch. In this exercise, the audience is asked to brainstorm a complete data visualization idea, including a main message, marks, and channels. Shirley introduces the graph that will be built throughout the rest of the class. Shirley explains the two parts to turning designs into code, which are drawing the geometric shapes, then translation from the data into their various channels. After explaining the distribution of the data, and introducing D3 Areas as the main method to form the visualization, Shirley live codes the chart solution. Shirley stresses the importance of readability in data visualizations. Shirley references several D3 Libraries created by Susie Lu that aid in readability by providing context in the way of axes and annotations. Shirley offers other ways to add aesthetics into charts with patterns, gradients, textures, SVG filters, and others. The work of Nadieh Bremer is introduced to help give context to the importance of these aspects. Shirley introduces interactions through D3. Simple interactions can be done with D3 alone, but more complex interactions have to have React (or similar) as an aid. 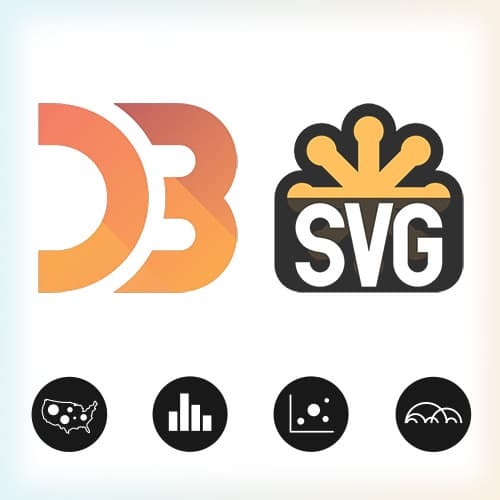 The process of the creation and utilization of SVG data visualizations at Netflix outlined in this section. Shirley gives sage advice that has been gained through working with the complex problems that have been encountered.